Think school is deadly boring? It’s also plain old deadly in this superhero caper! Born in a toilet U-bend, Long Arm has a talent for saving the day. But his human alter-ego, Ricky Mitre, is always in trouble. His grumpy (and very trumpy) teacher, Mr Pinkerton, hates him. So when a cool new supply teacher joins the school, Ricky’s problems are solved! Or are they? There’s more to this guy than meets the eye. Has Long-Arm met his match? Or are we just pulling your arm – sorry, leg? Very interesting . 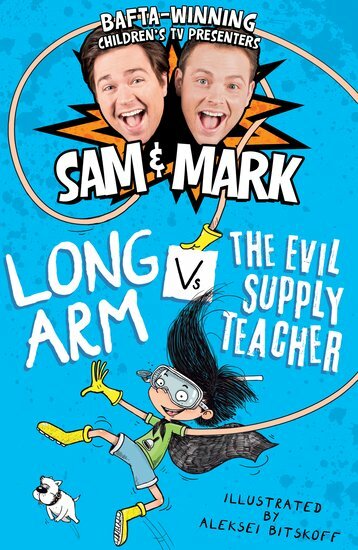 One long arm. One brilliant book. With infectious personalities and hundreds of hours of live TV under their belts, Sam Nixon and Mark Rhodes are an incredibly exciting duo. The pair have come a long way since Pop Idol in 2003, coming 2nd and 3rd respectively.